Amy Worden writes the Philly Dawg blog for The Philadelphia Inquirer. With her permission we are reposting her blog about the status of anti-cruelty bills as the legislature returns. Lawmakers will consider a flurry of animal-related bills as they return to the Capitol after the five-week long break for budget hearings. 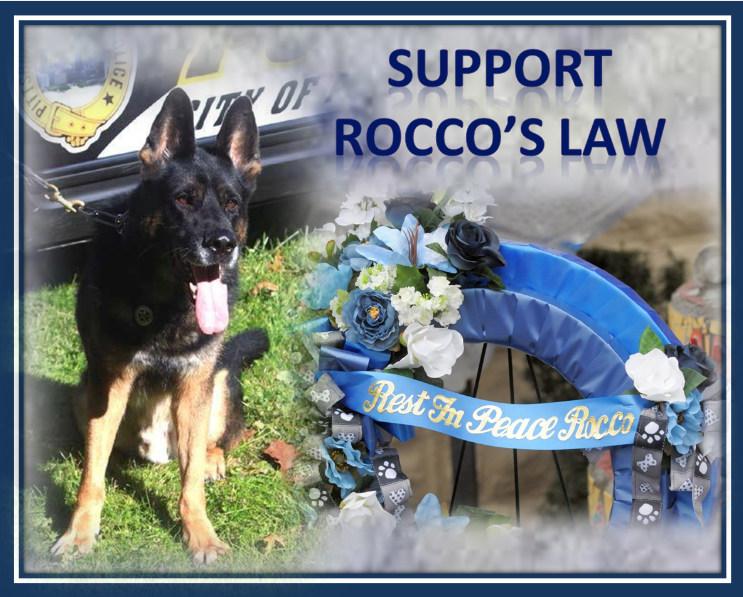 Topping the list is “Rocco’s Law” – bills designed to stiffen the penalties for anyone who severely injures of kills a police animal. The introduction of the bills in both the Senate and the House came after the Jan. 30 stabbing death of Rocco, a Pittsburgh police K-9 officer, as he defended officers trying to apprehend a suspect. An outpouring of grief followed the death of the 8-year-old German Shepherd. Rocco was given a hero’s funeral for his actions to save his human partners and 1,000 people lined up to say goodbye to him. Two bills (Senate Bills 1260 and 1261) – which already have 27 sponsors in the Senate – would increase the offense to a second degree felony, which comes with a fine of $25,000 and up to 10 years in prison. The federal penalty for killing a law enforcement dog is up to 10 years in prison and a fine of $1,000. Current state law classifies the torture or killing of a police animal as a third degree felony offense punishable by up to seven years in prison and a $15,000 fine, but the same penalty applies to the taunting or striking of a police animal. “This bill recognizes the fundamental differences between the two crimes and seeks to rectify the disparity by strengthening the penalty for the more serious offense,” said lead sponsor Sen. Matt Smith (D., Allegheny). Smith said he wants to get the bill on Gov. Corbett’s desk by June. Meanwhile, a similar bill introduced in the House may get there first. Legislation to boost penalties for harming a police animal introduced by Rep. John Maher (R., Allegheny) is slated for a committee vote this week. In other animal-related legislative news, a bill that passed the House unanimously last month is being held up in the Senate Judiciary Committee and will not move in its currently form, the committee chairman, Sen. Stewart Greenleaf (R., Montogmery) said in an interview. Under legislation dating to the 1990s, dog law agency keeps all court fees until the total collected tops $70,000. All monies over that amount go to support the courts computer system. The animal agency’s tithing to the court system was not an issue back then when laws involving kennels, stray dogs, licensing and dangerous dogs were not as aggressively enforced as they are today. Greenleaf said he is concerned about the loss of revenue to the courts. “I’haven’t seen compelling reason to take away from courts,” said Greenleaf. “It takes all the money and leaves court without any. I woudn’t support that “. But Greenleaf said he was open to “some type of compromise” if it was offered. The court collects fine money from other enforcement agencies as well (not however the Pennsylvania Game Commission which prosecutes animal-related crimes we learned). It also tacks on a separate $8 fee to every case heard in the state’s court system. A top official in the Department of Agriculture said the dog law office which relies on the fine revenue along with license sales to support employee salaries and equipment purchases – needs the fine money to stay solvent. “The fact of the matter is that the requirement to send this money to the judicial computer fund is a morale buster, it deters some [dog wardens] from putting in the massive amount of work needed to win a $300 maximum fine for not having dog licensed/rabies vaccinated,” said Michael Pechart, special executive secretary for the department. Often times he says judges will throw out the fine after the person says they got their dog license or vaccination after being cited, said Pechart. Greenleaf also said his committee is considering a bill to ban 24/7 dog chaining but that he remains concerned about the “unintended consequences” of such a ban. Animal welfare activists have been working on a statewide tethering bill for at least six years without getting a floor vote in either chamber. In the interim, anti-dog chaining movement has had success on a local level enacting bans in the City of Harrisburg and several York County municipalities. A six-year struggle to win a bill’s passage is just a blip on the timelime of those seeking to end live pigeon shoots in Pennsylvania. Humane advocates have tried unsuccessfully to end the practice for 20 years. But is there a glimmer of hope on the horizon? Greenleaf, a supporter of the ban who moved a bill out of his committee last session is ready to bring it up again this year but he wants assurances it will get a vote before the full Senate. Advocates say they feel strongly that the votes are there to pass the bill despite opposition from the National Rifle Association. “I think it has a chance to pass this year,” said Greenleaf.